Passing the village of Al Khitaym at the start of the famous W6 balcony walk in Jabl Shams, I spotted Waleed and his brothers working on their home garden. I greeted them and asked them if I could take a photograph he stepped forward knowing that I was addressing him. 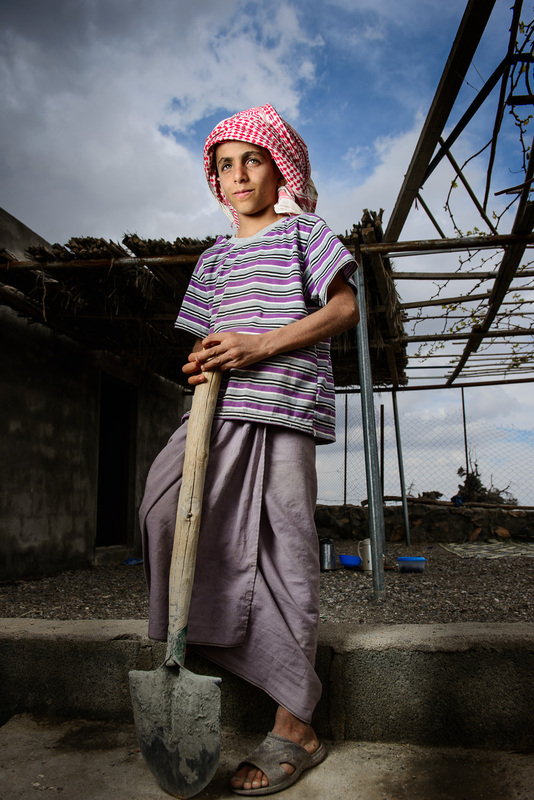 I asked him where he wanted me to photograph him, he walked to the steps and stood there with the shovel still in his hands, unlike most of my subjects I did not have to pose Waleed. His pride in helping his elder brothers was evident in the way he stood there gently supporting the shovel and looked at the camera with a naturally confident smile. I did not have to pose Waleed… all I had to do was talk to him and wait for his expressions settled as he posed after answering me before I released the shutter. What a beautiful photo, Issa! This boy is a natural in front of the camera for sure!